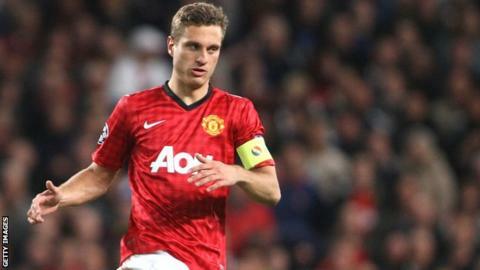 Manchester United captain Nemanja Vidic has suffered a new injury setback, the club has revealed. Vidic had been ruled out for eight weeks following a knee operation in September, but manager Sir Alex Ferguson now says he does not expect the defender back until Christmas. "I think we're talking around December for Vidic," Ferguson said. "Maybe around Christmas time." Vidic, 31, has played just four league games this season. He has not played since the 1-0 home victory over Galatasaray in the Champions League on 19 September. Since then United have conceded 17 goals in nine league and cup games. The news about Vidic comes after Ferguson said fellow defender Chris Smalling, who was hoping to be available to face Arsenal on Saturday, was not quite ready to return from a metatarsal injury. Defender Phil Jones is also out with a long-term knee injury, leaving Rio Ferdinand and Jonny Evans as United's only two experienced centre-backs.